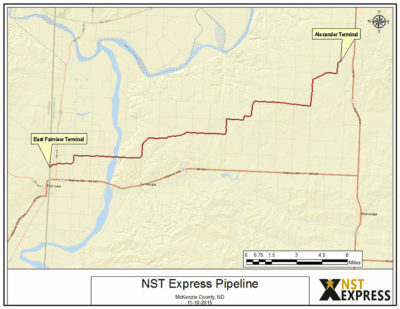 NST Express, LLC (“NSTX”) is announcing an Open Season for the NST Express Pipeline (the “Pipeline” or the “System”), a new FERC-regulated crude oil transportation pipeline being constructed in McKenzie County, North Dakota. The Pipeline will have the capacity to accept 40,000 barrels per day of crude oil from various interconnects and a truck receiving terminal in Alexander, North Dakota. By bidding for capacity on the Pipeline, producers and marketers can deliver crude through the System to Northstar Midstream’s crude-by-rail facility in East Fairview, North Dakota and on to east and west coast markets served by the BNSF railroad. NSTX is conducting an Open Season to obtain long-term volume commitments for this new crude oil transportation System. The Open Season will provide an opportunity for interested shippers to present offers for long-term transportation commitments for capacity rights at competitive rates. The Pipeline is projected to be in service in November 2016.